As a teenager, I used to go to Barnes and Noble and slink into the New Age section to read up on, well, EVERYTHING. Of course I was too embarrassed to buy any of the books. What if someone recognized me and then knew I was this closet weirdo. So I settled for frequent trips to the book store to satisfy my interests. It has since become quite acceptable to be spiritual these days and actually being spiritual today has a broad spectrum to slide on. It seems there are modern mystics popping up out of every corner and I’m grateful for it. I’ve been a drawn to crystals, energy, and spirit for as a long as I can remember but didn’t know what to do about the “interest”. The last few years has opened up a never-ending library of information and shops. 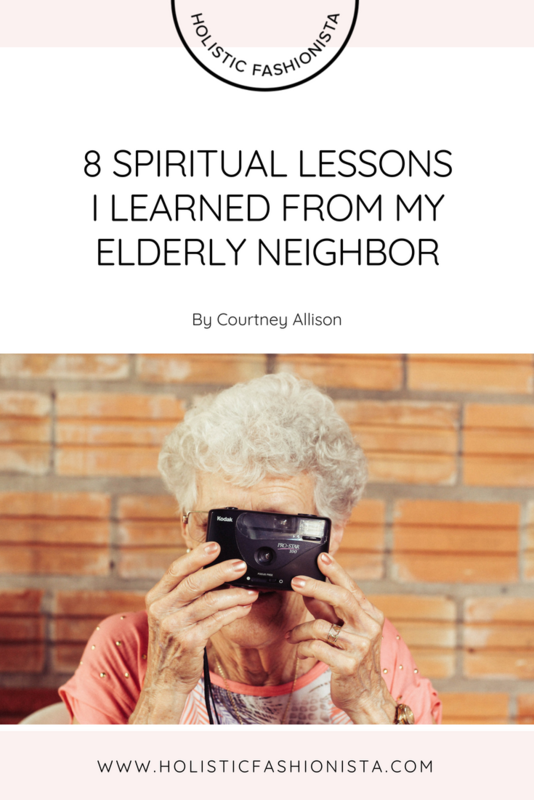 But before all this I had a hands-on introduction to spiritual living from an 80-something year old woman, who would never consider herself spiritual. Actually spirituality was one of the only things we didn’t speak about. Trudy was my little old lady neighbor across the street. She was such a little spitfire. I first met her after a very bad New York snowstorm in 2008. A friend had done a favor for me and plowed my driveway but in doing so he pushed a lot of the “dirty snow” onto her “clean snow” and she came outside to argue such. I laughed to myself and apologized halfheartedly and vowed to never do it again. That same winter, her husband became ill and shortly after, died in the hospital. I remember just knowing it happened, things were just different over there. I would watch her through her window, sitting at her dining room table, combing over papers and rubbing her eyes till all hours of the night. You could feel her sorrow from across the street. Spring came around and brought the neighborhood outdoors again. Trudy’s yard was always meticulously kept and she would often be pruning, trimming, and/or correcting the landscapers as they worked. I would wave each day, which she usually ignored but she eventually waved back to me. My children were very young then and would wander over and she would invite us in for tea and some company. We became fast friends and on occasion we would drive each other crazy. She would comment on my tank tops and lack of make up on certain visits, pulling out photos of her youth in Vienna for comparison. Pointing out the best way to pose for photos, which by the way, was placing one leg in front of the other with shoulders back and angled, chin up, of course. She gave me handwritten recipe cards for the “world’s best brownies” from scratch and antiqued dresses for my daughter that she designed and sewed herself in her earlier life. She showed me how to grow herbs and also how to regrow small cuttings from other plants. Trudy became my teacher of all things made with love and quality; this beautiful, homegrown, fashionable bubble that before her was just crazy mom hair and ripped jeans (I kind of enjoyed watching her disapproval whenever I wore them). Her nails were always perfectly polished and she had matching gloves for every hat she owned. She would enjoy showing me her jewelry and which pieces she would wear when she wanted to show off her delicate neck or which one was better to inspire a little extra confidence during an evening of cards. We would talk about almost everything and occasionally bicker, but I really valued this generational bond we had. I would complain about my day to day nonsense and she would share her life experiences, both good and bad. See, Trudy was an Auschwitz survivor. Her stories fascinated and humbled me. You would never know it unless she told you. It may have been the way she carried herself; like a tiny queen. Unfortunately I didn’t have that much time with her. She died the following year at 88 years old, but she past peaceful in bed and beautiful as ever. What she gifted me was a wealth of magic, perseverance, a lot of know-how, and some beautiful hydrangea cuttings. It’s ok to own your messy bun and comfy clothes but strategic color and meaningful accessories can change your mood and therefore, your day. Good vibes are contagious, so put your best foot forward. Eat only until you are full but leave room for daily indulgences. Make sure it is made from quality ingredients. Don’t underestimate the power of flowers. Their beauty and perfume enhance and encourage the rest of your garden. Also, don’t let space hinder your green thumb. Your garden can be your entire backyard, a few pots on a terrace, or even a small space in a community garden. Bonus points if you gift a cutting from one of your own plants to a friend or neighbor. It spreads love, beauty, and good vibes. Have a cup of fine, hot Dutch cacao in the morning and a cup of chamomile tea at night. Be open to lessons from all people, from all walks of life. You may not have to look far and wide, sometimes these “mini gurus” might live right next to you. Talk to children, they tell you the truth. Talk to the elderly, they show you what to do with it. Be a storyteller. Even if no one will listen. Storytellers hold the magic and the knowledge that can light the world. You can’t be a queen without being some kind of survivor.